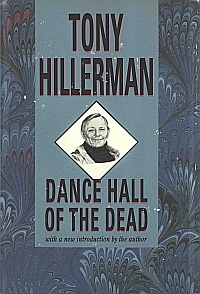 In 1991, the Armchair Detective Library published three runs of Tony Hillerman's 1973 novel Dance Hall of the Dead. This edition, with a blue marbled dust jacket and dark blue cloth covered boards and gold embossing on the spine, is an example of the Trade Edition, replete with a new introduction to the novel written by Hillerman himself. At the center of the front cover of the dust jacket is an inset on-the-bias drawing of Hillerman. Format: Hardback, 22.5 x 15 cm. Binding: Dark blue cloth-covered boards with gold lettering on spine, including blind stamp of publisher's device. Paper dust jacket with blue marbling, black text, and a white inset on-the-bias drawing of Hillerman.